Anacostia Historical Society members pose in front of the Carver Theater, which served as the first home for the Anacostia Neighborhood Museum, now known as the Anacostia Community Museum. 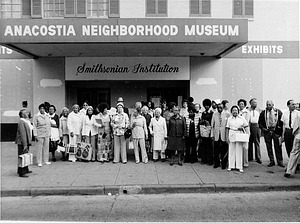 Louise Daniel Hutchinson, historian at the museum, is the seventh person from the left in the front row. 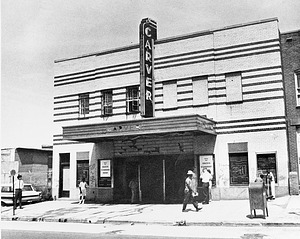 The Carver Theater, before its renovation for the Anacostia Neighborhood Museum, located on Martin Luther King, Jr. Ave in Anacostia. 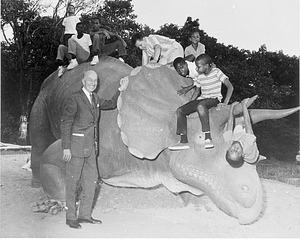 The Museum opened in September 1967 and remained at this location until April 1987, when it moved to its present location, 1901 Fort Place, S.E., Washington, D.C., and renamed Anacostia Museum. The museum is now known as the Anacostia Community Museum. 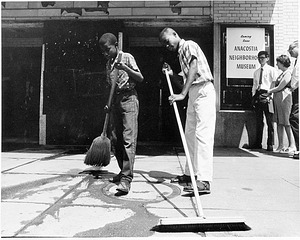 Two boys sweep the enrance sidewalk in preparation for the opening of the Anacostia Neighborhood Museum located in the renovated Carver Theater on Martin Luther King, Jr. Avenue in Anacostia. 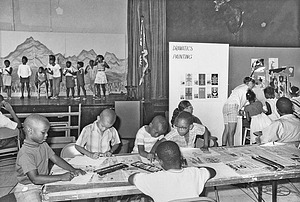 The museum is now known as the Anacostia Community Museum and is located at 1901 Fort Place, S.E., Washington, D.C.
Children in the forefront are painting and others are staging a play at the Anacostia Neighborhood Museum, now known as the Anacostia Community Museum, 1901Fort Place, S.E., Washington, D.C.
American Association for the Advancement of Science's exhibit, 26 December 26 - December 30, 1972, held at the Anacostia Neighborhood Museum, now known as the Anacostia Community Museum, located on Martin Luther King Avenue, S.E. The new Anacostia Exhibits Center of the Anacostia Neighborhood Museum allowed the museum to design and produce exhibitions and also to provide training for minority groups. 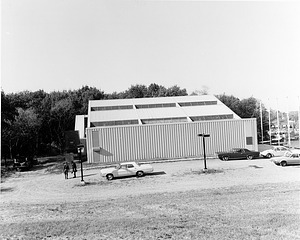 This facility served as the core for a larger museum building that was completed in 1987 when it was renamed the Anacostia Museum. In 1995 the Museum was renamed Anacostia Museum and Center for African American History and Culture. After the Smithsonian launched its new National Museum of African American History and Culture, the Museum was renamed Anacostia Community Museum in 2006. 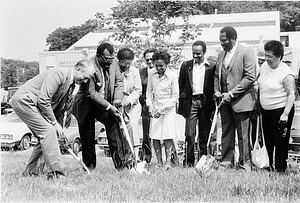 Ceremonial groundbreaking at 1901 Fort Place, S.E., Washington, D.C., in May 1985, for the Anacostia Neighborhood Museum (AM), renamed the Anacostia Museum in 1987. In 1995 the Museum was renamed Anacostia Museum and Center for African American History and Culture. After the Smithsonian launched its new National Museum of African American History and Culture, the Museum was renamed Anacostia Community Museum in 2006. Left to right: Museum Historian Louise Hutchinson (AM), Robert Stanton (National Park Service), John Blake (chair of AM board), Ann King (former president of Fort Stanton Citizens Association[FSCA]), James Mayo (ANM exhibit supervisor), Addie Cook (FSCA president), AM Director John Kinard and Secretary Robert McCormick Adams. 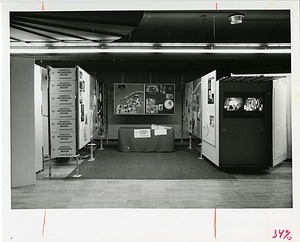 The museum opened in the Carver Theater building in 1967. 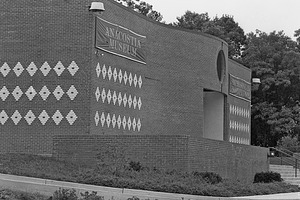 The Anacostia Museum's new building at 1901 Fort Place, S.E., Washington, D.C., opened May 17, 1987 next to its laboratory-research center built in 1975. The new building is approximately 10 blocks from the Museum's former location and was developed by the architectural firm of Keyes Condon Florance. 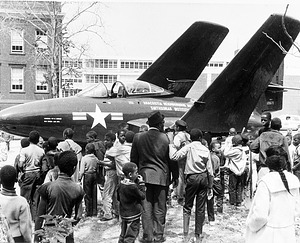 In 1995 the Museum was renamed Anacostia Museum and Center for African American History and Culture. After the Smithsonian launched its new National Museum of African American History and Culture, the Museum was renamed Anacostia Community Museum in 2006.